Effectively cleans stubborn marks and stains on the waterline, covers, shutters, solid covers, etc. The Easy Pool’Gom® is made from a patented plastic foam whose distinctive feature is that its surface hardens when humidified. Nevertheless, the hardened surface remains soft and pliable enough for easy use and scrubbing, even in those hard-to-reach nooks and crannies. Its original format (8 x 10 cm) like a water drop makes for easy access in the corners of the pool. 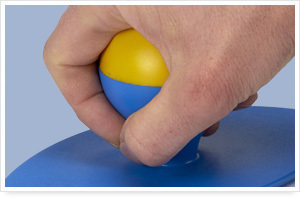 The silicone finish of the handle offers an excellent grip. 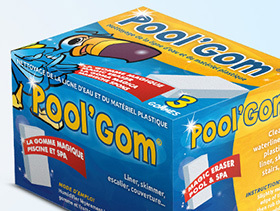 Containing no detergents or chemicals, Easy Pool’Gom lest you scrub away stubborn marks and stains on the waterline. Effective on all types of surfaces: liner, polyester coatings, tiling, covers, shutters, canvas covers, etc. 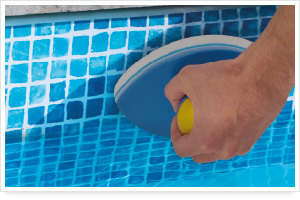 Easy Pool’Gom® features a round handle specifically designed for cleaning the waterline. The fruit of a long study carried out by professional ergonomists, this product ideally meets the requirements of users, requiring less effort and delivering greater effectiveness, for an optimal result thanks to its high-quality eraser (density and appearance). Why is the Easy Pool’Gom® so efficient? Easy Pool’Gom® stands out from other products on the off-the-shelf thanks to its round ergonomic handle, offering greater cleaning efficiency and much more practical than conventional handles. Its silicone finish offers an excellent grip. 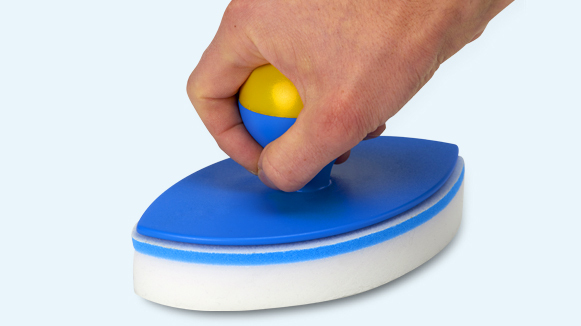 Its distinctive water-drop shape facilitates access to the corners of the pool, and its hard-wearing eraser is thick (2.5 cm) and large (8 x 10 cm). 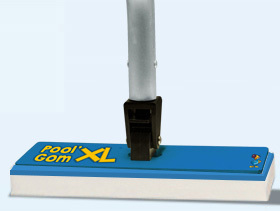 Can the Easy Pool’Gom® reach into the corners of the pool? Its original format like a water drop makes for easy access in the corners of the pool, where stubborn marks and dirt often accumulate. Why is it called an eraser rather than a sponge? Once dampened, Easy Pool’Gom® is used as an eraser, in other words, with a repeated back and forth motion, which guarantees optimal results. The product breaks down like an eraser, which explains it exceptional efficiency. Are Easy Pool’Gom® refills available? 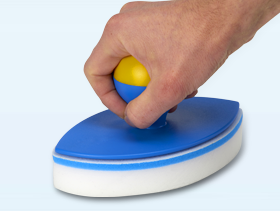 The Easy Pool’Gom® is sold with one eraser, and refills are available and sold individually. What surfaces can the Easy Pool’Gom® be used on? All surfaces: liners, tiles, earthenware, polyester, shutters, pool covers, etc.. 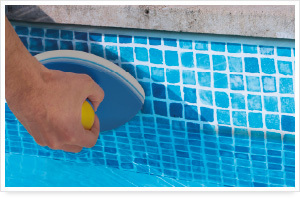 However, Easy Pool’Gom® is abrasive, so we recommend doing spot tests on a hidden area first. How long does Easy Pool’Gom® last? The Easy Pool’Gom® is an expendable item. 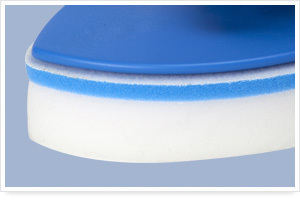 Its service life depends on the surface to be cleaned, its porosity and how dirty it is. After use, store the holder and its refill in a dry, sheltered area.